I can't seem to figure out how to blog much lately. But I did manage to get myself quoted in the San Francisco Chronicle today. 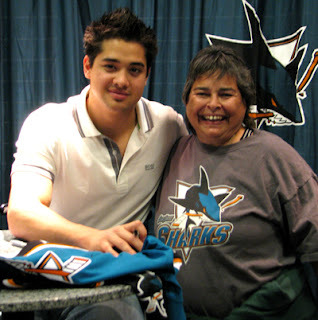 Plus I am showing off my picture with Sharks rookie Devin Setoguchi. I know, he's cute, huh? What a nice guy, too. It was nice to see so many Asian folks out there to get his autograph. He signed my new jersey. I guess I have been a little brain dead post Cupertino elections. I worked on my friend, Gilbert Wong's campaign. I am happy to report that we won and he will be sworn in this coming Tuesday. Then me and the esposa are running off to New Orleans. Finally I will get to see my friend Chris. Last time I saw him was when he was running for the state house in an attempt to become the first openly gay elected person in Louisiana. The election was soooo close, he missed the runoff by 56 votes. Damnit, so close. BTW, if you get a chance, go look at his art work. He is selling these really cool ceiling tiles on Craig'sList in New Orleans. It is under arts+crafts. Now about that job, I am hoping for something very soon. But then I have been hoping for 4 months now. Please, universe, how about a meaningful job with enough money before Christmas. OMG - I love Chris' artwork! I had no idea. Give him a big hug and a sloopy wet lesbian kiss from me. I will but buy something from him, it will look great in your house!